The birth of a new child is one of the most precious times in life. The first few days are so fresh and surreal as time seems to stand still. Then the frenzy begins… The demands of a new baby and regular life are in daily, even moment to moment, conflict until a steady rhythm is finally achieved (although this is always a delicate balance often upset by growth spurts, tummy aches and teething). Those are beautiful days to be cherished and treasured. For the new mom, it can be a veritable roller-coaster ride. The elation of birth, the joy of family and friends, and the beauty beyond description of a newborn baby bring so much wealth to a mother’s soul. Lack of sleep, recovery from birth and the awesome responsibility of a wee babe who needs her constant attention can weary even the most seasoned of mothers. It’s a vital time for those who’ve gone before to band together provide their help and support, and to give back, in a way, to those who gave to them. In our congregation, we organize meals for these young families which are delivered warm each evening. New mothers are exceedingly blessed, lifted and loved through this practical service. The newest members of our congregation are watched and waited for, and upon hearing of their arrival the forces that be mobilize. As life has it, these babies usually come during hectic times. Even though I’m usually juggling several things and putting out a few fires, I still love planning and preparing a meal so vivid are my memories of those days when we brought each of our 4 little ones home. As a plan, I reminisce. I remember some of the best gifts I received during those days whether word or deed. I remember the fuzzy, crazy days filled with newness and love. I remember the extreme lack of sleep and difficulties and struggles of nursing. The last time I was called upon to deliver a meal, I wanted to add a little gift. 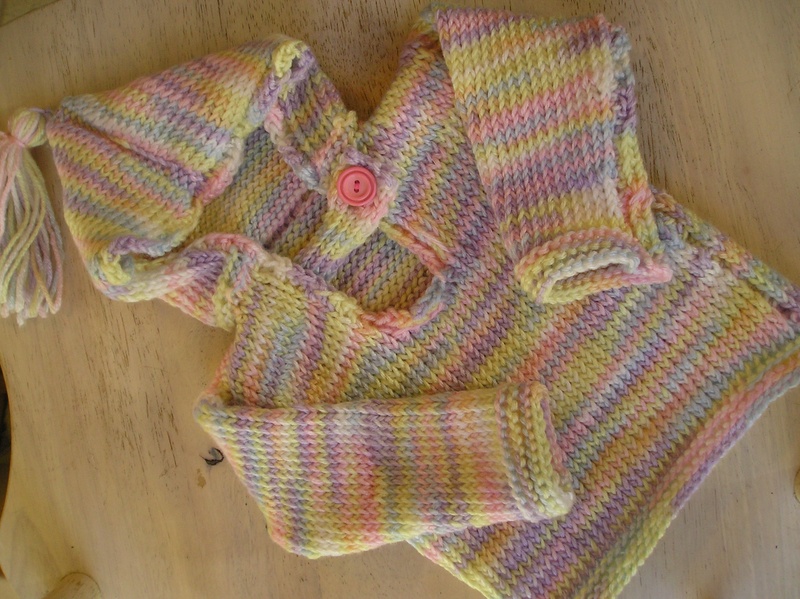 I had some baby yarn and found this pattern on Lion Yarn’s website and I knit. Knitting a gift affords one a lot of time to prayerfully ponder the recipient which I did with each stitch. For me, there is a joy unspeakable in creating something uniquely special and personal. Since the baby girl had an older brother, I also created a busy gift for him which hopefully would bring him joy and be helpful for mom (I was completely enamoured with busy gifts for my older sons when the littler ones were born!). I decided on a crayon roll similar to the one I made for my little guy inspired by this tutorial and this tutorial. All projects are a learning experience. As a whole, I loved how the sweater turned out, but would definitely change a few things next time I use the pattern. I would convert the pattern to circular needles so it would be a more seamless design. What do you think? What is your new baby tradition? Do you have a go-to baby gift? Wish I knew how to knit, but never took the time. Nothing beats a handmade gift, especially for a baby. 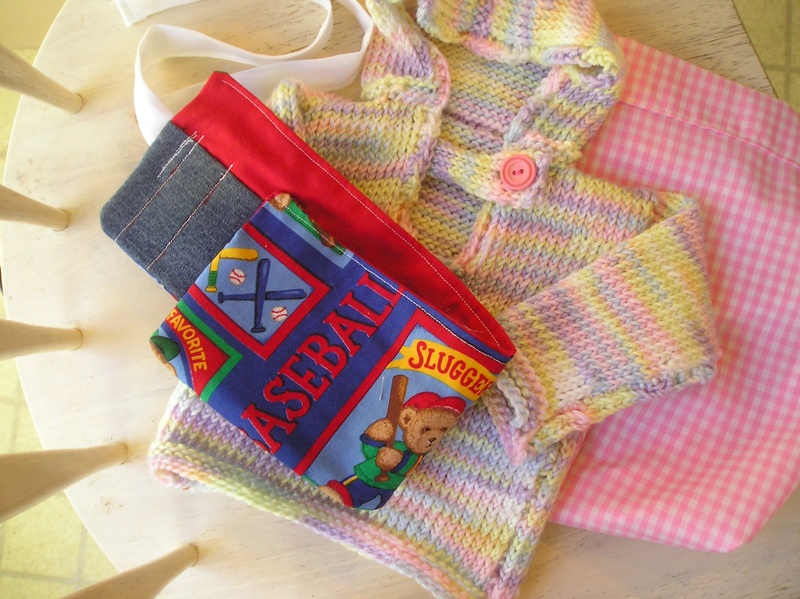 For those that don’t have the time or the ability to make a homemade gift, Shop The Gift Basket Store, http://www.shopthegiftbasketstore.com carries hundres of gift ideas for the new baby girl or baby boy. They make it easy to just pick, click and ship.